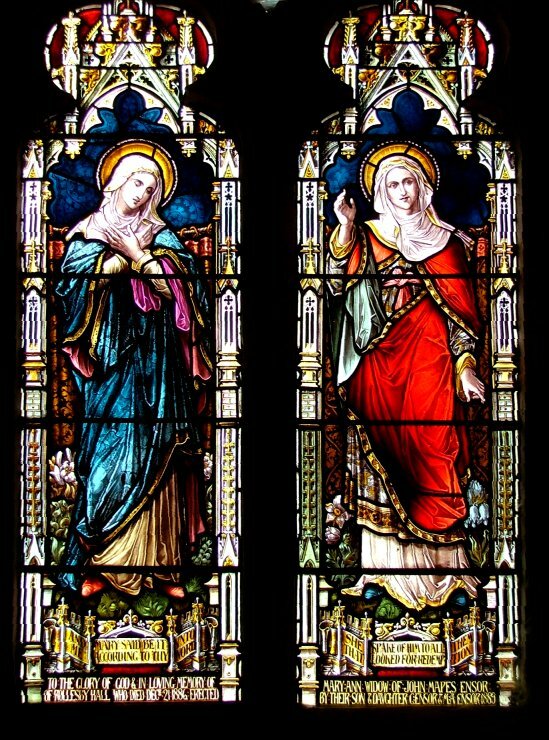 Something extraordinary happened to the Church of England during the middle years of the 19th century. For generations, it had been an arm of the state, the rock upon which the protestant nation was built. But a series of reform acts in the 1820s and 1830s made that rock tremble. Firstly, many of the administrative functions of the Church were taken away and handed to secular authorities. And then, even worse, Catholicism was decriminalised. Suddenly, it was possible for Christians to worship without owing allegiance to the Crown or to the Bible of non-conformism. 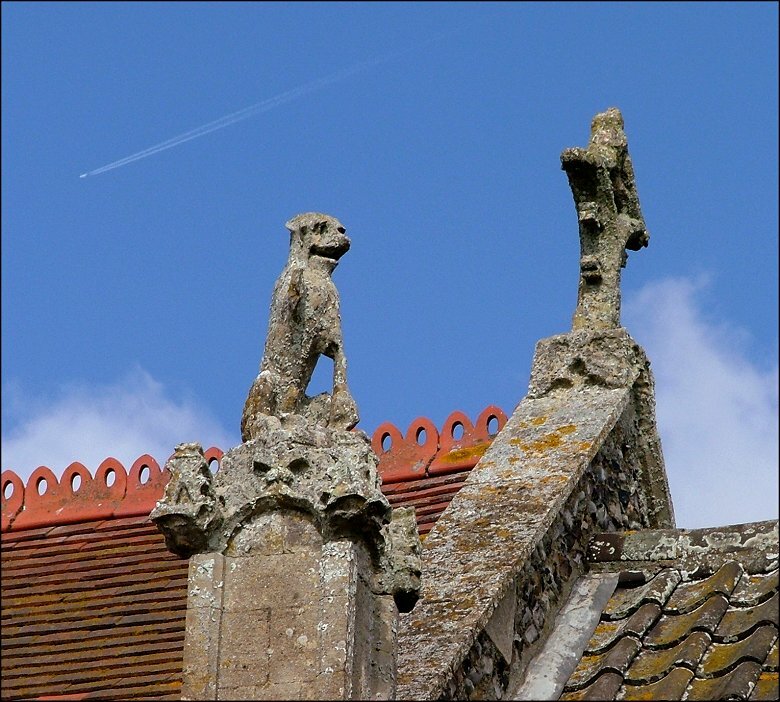 Where did the Church of England's identity now subsist? Was it to be sidelined as a mere protestant sect? A group of academics at Oxford University sprang into action. They called for the restablishment of Anglicanism as a National Church. They issued a series of tracts, explaining the historic roots of the Church of England, and its self-perception as a Church with an apostolic tradition. Because of this, they became known as the Tractarians, or the Oxford Movement. The great majority of the British people in the 1830s and 1840s had a serious mistrust of anything that had happened before the 16th century Protestant Reformation. It smacked of Popery; but the Tractarians took on the task of smoothing over the Reformation gap and re-establishing the connection between the 19th century church and its medieval predecessor. They made a spectacularly successful job of this, and as a result the Church of England was changed forever. 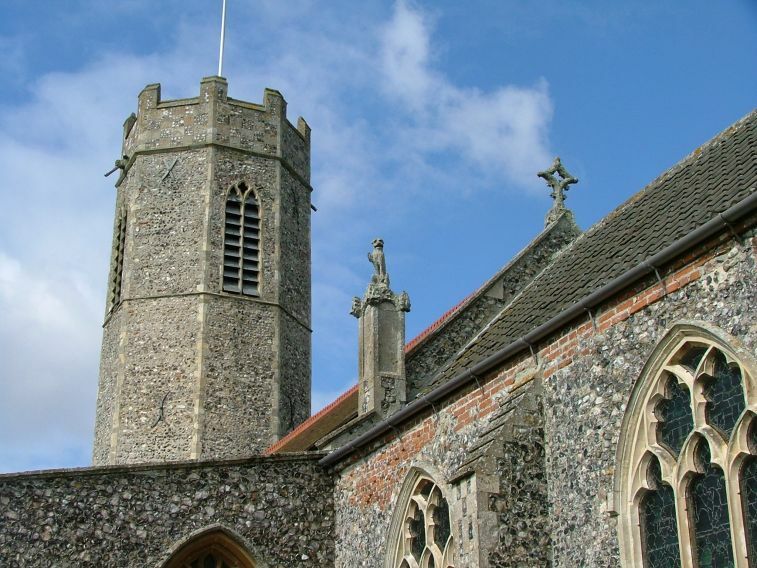 In just about every parish in the land, Anglican churches were restored to their medieval integrity. Sacramental chancels were refitted, the old protestant furnishings thrown out, and surviving medieval artefacts rediscovered with alacrity and restored enthusiastically to use. By the 1870s, Anglican churches were once again a riot of colour and ceremony, where only half a century before most had been dull, plain, preaching boxes. There were, of course, casualties. 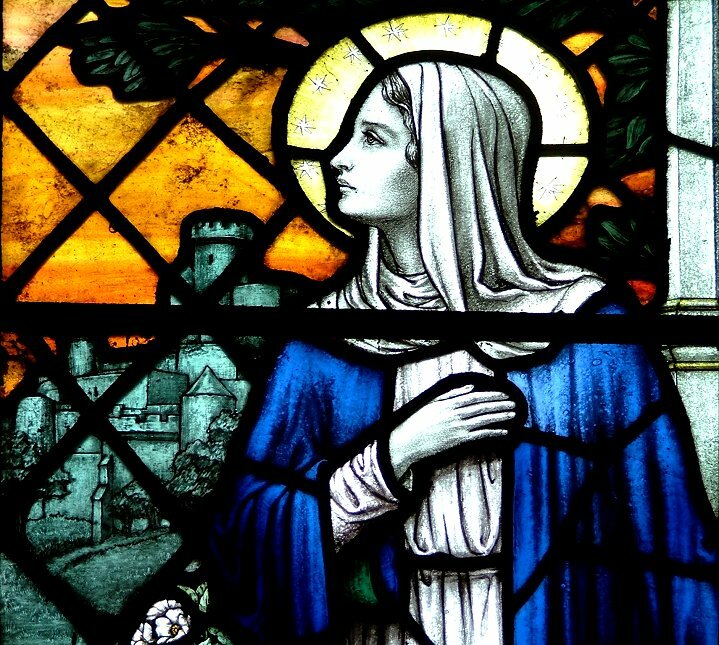 In seeking out the Catholic medieval roots of the Church, Oxford's academics had also painfully exposed the gap between the modern Church of England and the essential nature of Catholicism. Was it really possible to find a middle way between what Anglicanism believed itself to be, and what it was unable to demonstrate as a reality? Or had the Reformation really been a fracture? Inevitably, since the touchstone of Catholicism is the Apostolic succession, thousands of people, mainly intellectual and upper-middle class, left the Church of England to be received into the Catholic Church. But the central project of the Tractarians had succeeded. They re-established the Church of England as the spiritual and ceremonial pulse of the Nation. Tractarianism was fully in the ascendant, becoming Anglo-catholicism as the century progressed, and reaching its peak during the First World War, as the Church provided the triumphalism necessary for the fight, and the authority to mourn for its casualties afterwards. But the First World War had broken the spell. Reaching a peak in the 1930s, the ceremonies and liturgies of the High Church wing began to ring hollow, and by the 1950s and 1960s the Anglo-catholics were a minority. Newer spiritual currents were running deeper; evangelicalism was undergoing a renaissance, especially in the cities. 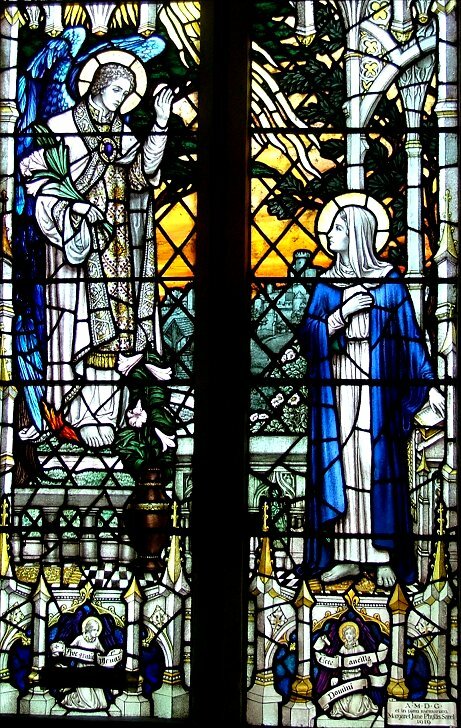 After the 1992 decision to ordain women as Priests, Anglo-catholicism fragmented; the larger, liberal wing sought out a quieter, more intellectual spirituality. The spiky, militant wing was left to sulk outside the doors of the Church, administered by Flying Bishops and treated as an exotic flower. How much longer can it bloom, or even survive? And yet, something remains. 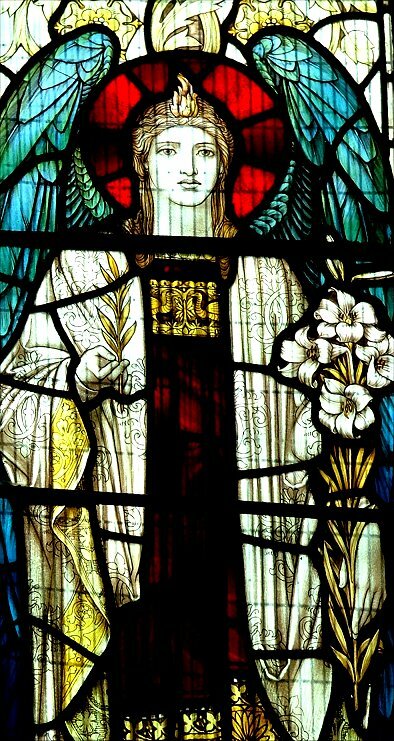 Because the great wave of restoration in the 19th century, handsomely bankrolled as it was by the booming economy and a new, wealthy landed class, produced a massive refurnishing of English churches, not least in the way of stained glass. That the windows are full of coloured glass would be the most startling change a 18th century Anglican would notice if he could visit a church today. 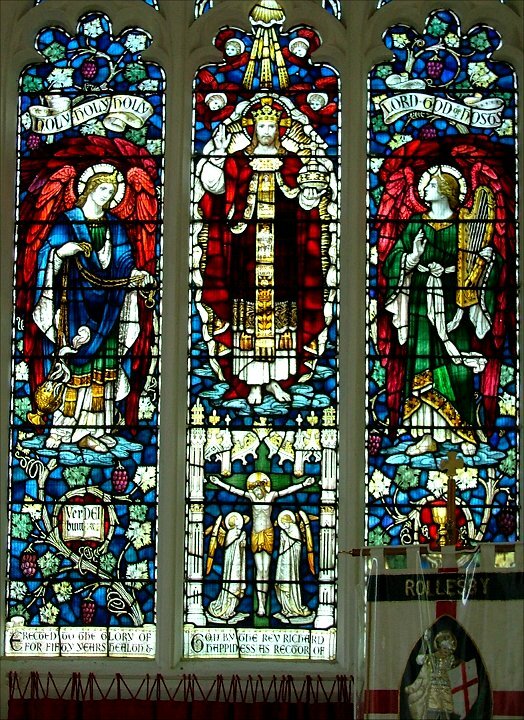 In the 20th century, as Anglo-catholicism retreated, and High Church ceremonial disappeared, the glass remained. And so it does today, often the only surviving evidence of that remarkable time. 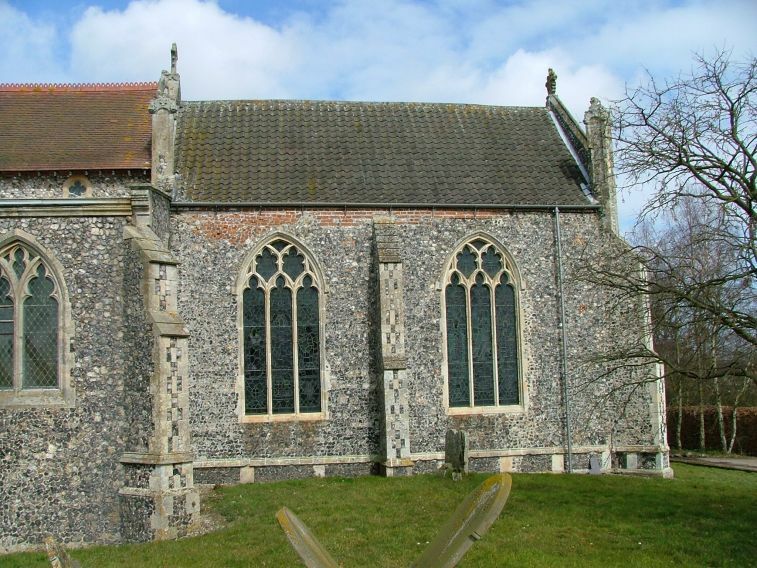 There seems to have been a lot of money about in this part of Norfolk during those years, because the churches were, in the main, extensively restored and furnished. Much of this has gone today, but as I say, the glass remains, and here at Rollesby there is an impressive collection. 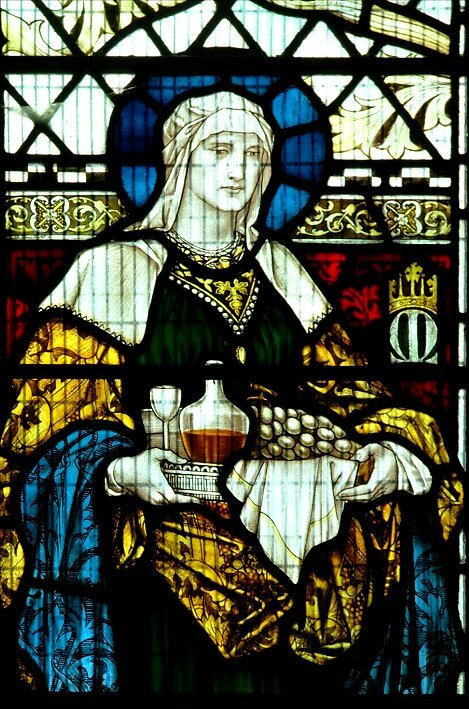 At Ormesby St Margaret up the road, the medievalisation of the building was paid for by the Lacon brewing family, but here the benefactor was the Rector himself. The gift of the living, £657 a year, about £130,000 in today's money, was in the hands of the Tacon family, and in 1872 the current owner, Richard John Tacon, presented himself to the living. He was to remain Rector for nearly sixty years, and in that time he would transform the interior of this church. 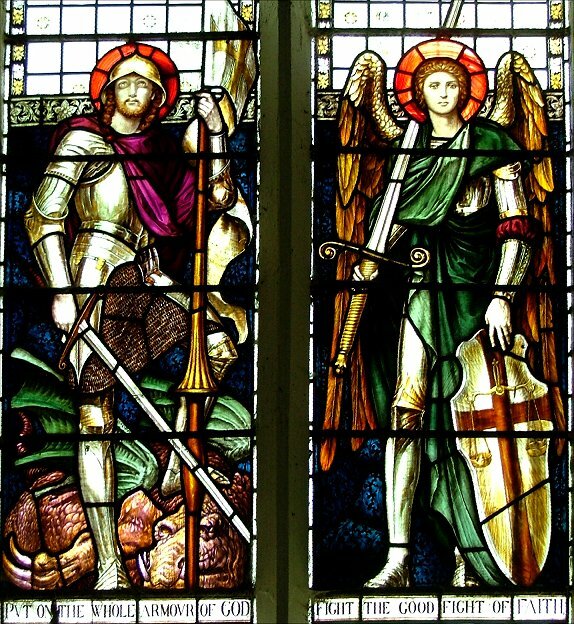 Because of him, St George has one of the largest collections of Victorian glass east of Norwich. 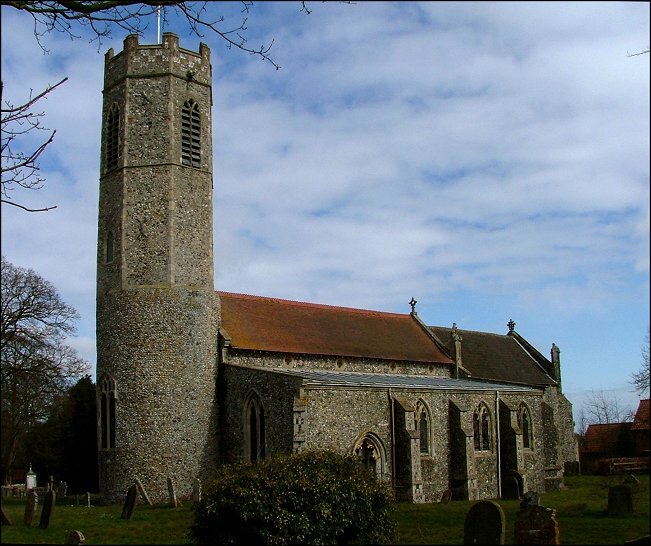 In this area, only Ormesby St Margaret and Filby have more, and they are much bigger churches than this one. 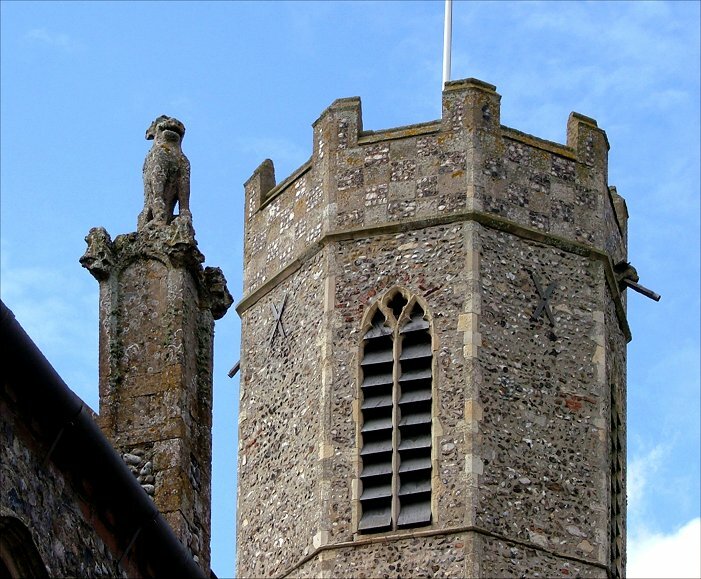 I mention all this before anything else merely to illustrate the point that English churches are rarely evidence of continuity, but of the drama of violence and ideas. The architectural historian Andy Foster has described history as a palimpsest, but not all historical periods write with equally heavy hands. 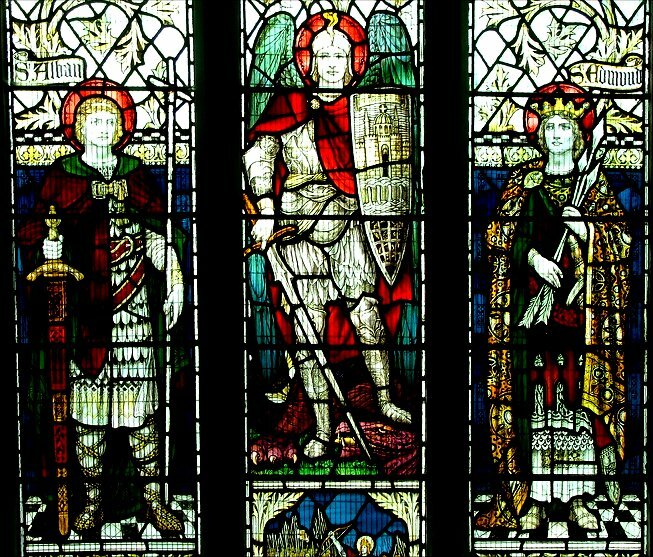 The character of St George today is almost entirely the work of the Reverend Tacon - and yet, he has been dead eighty years, and virtually nothing in the Church of England remains the same. The liturgy has changed, ideas and attitudes have changed, and certainly the centrality of the church in mainstream English life has changed, and gone for good. And yet still these windows remain. 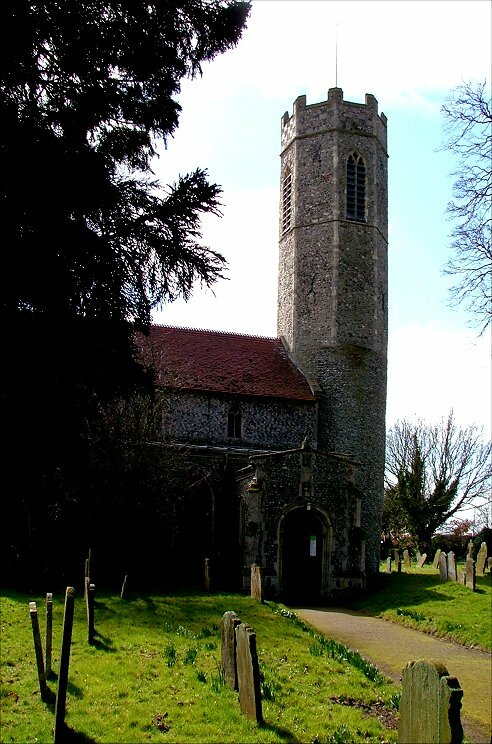 I want to tell you something very curious about Rollesby church. 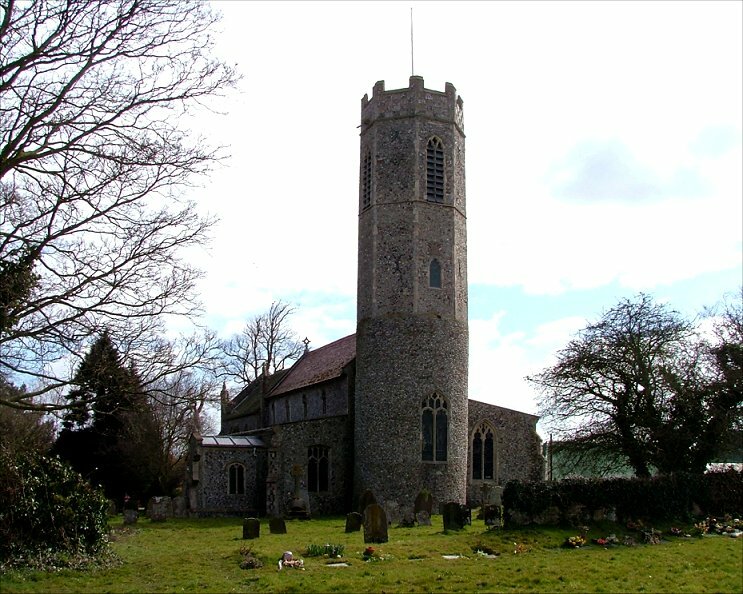 This part of Norfolk still retains much of its High Church ceremonial tradition (just as the Norwich Diocese retains more than most in England) and it is still possible to light a candle in Rollesby church. 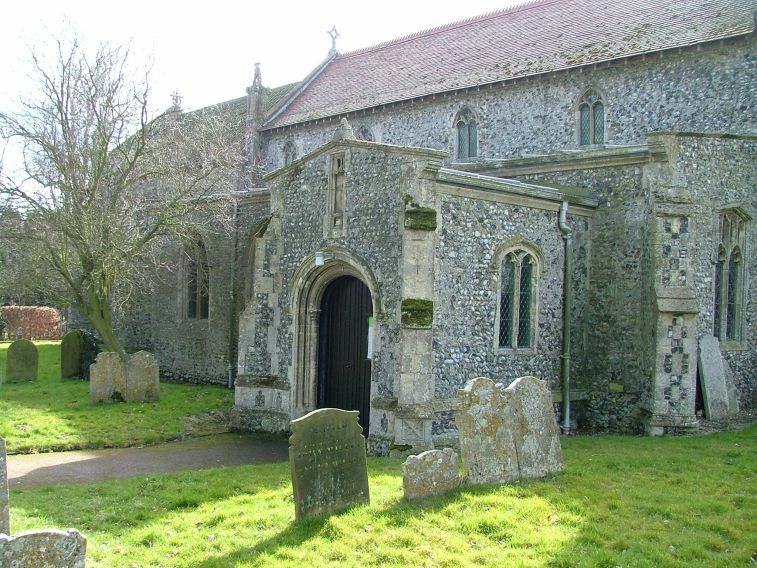 At least, it is but it isn't; for St George is kept locked, and there is no keyholder notice. And here's an odder thing. 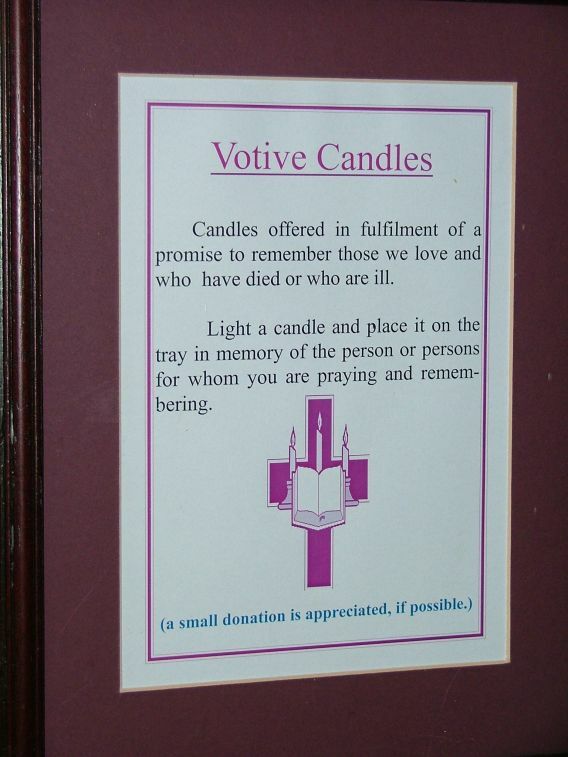 A sign beside the candlestand reads VOTIVE CANDLES: Candles offered in fulfillment of a promise to remember those we love and who have died or who are ill. Light a candle and place it in the tray in memory of the person or persons for whom you are praying and remembering. A pretty idea, but that's not what votive candles are for at all, and certainly the explanation sits ill at ease with Anglican theology. I have expressed my doubts before on this site about the pagan cult of the dead that seems to inhabit graveyards these days; so many people worshipping their ancestors' graves with flowers, but no Christian intentions. And why should they, when so many of the churches are kept locked? They could not pray for their ancestors' souls in the presence of the Blessed Sacrament even if they wanted to. Is this sign in the church a mark of the way Christianity is naturally developing? Or a cynical attempt to preserve one last Anglo-catholic devotion by handing it over to other uses? But how would graveyard users ever make use of it if they cannot get into the church? I really didn't understand, so I went outside and wandered around. It was a bright spring day. The blue sky set off beautifully Rollesby's magnificent chancel with its crowning pinnacle figures. 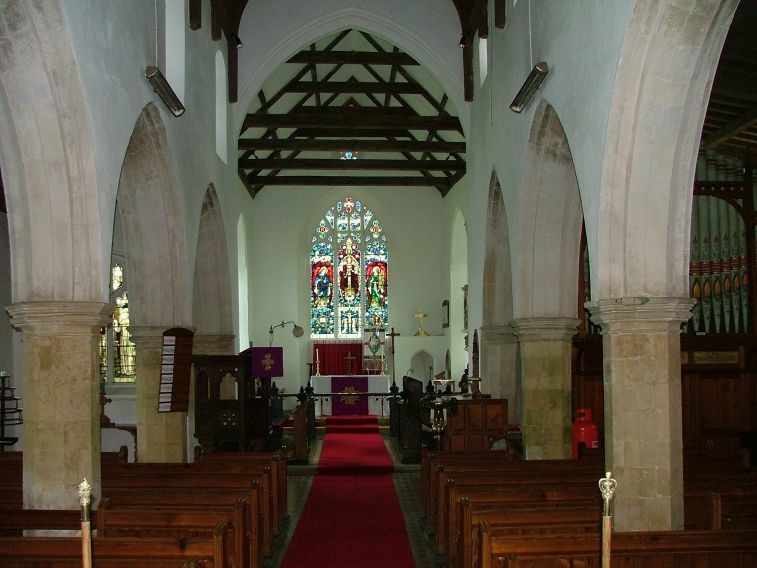 The nave, aisles and chancel, unusually for Norfolk, are almost entirely of the Decorated period, the early 14th century, with little of the more familiar Perpendicular architecture of a century and more later. 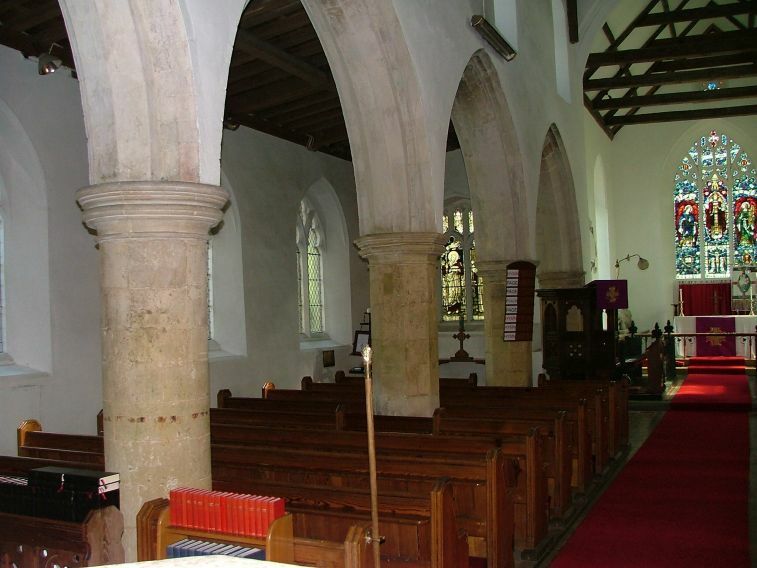 The clerestory in particular is a textbook example of the period, and look out for the cusping on the south doorway. 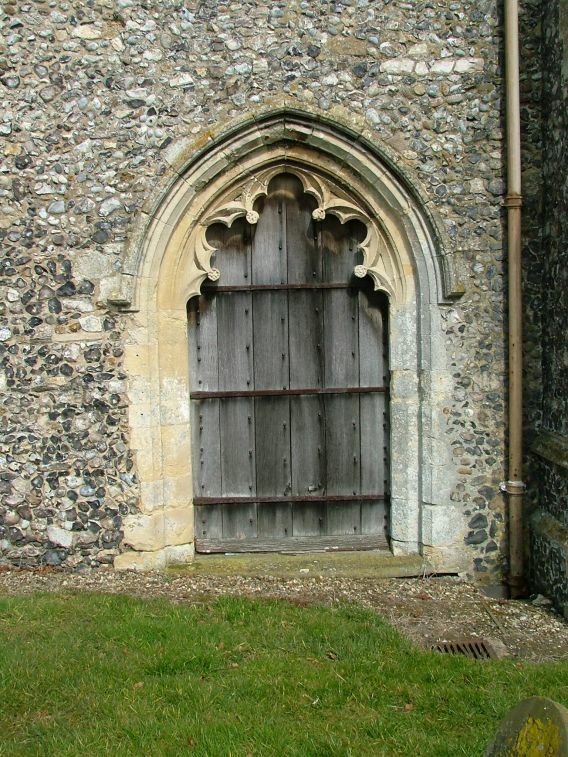 The window tracery is largely Victorian, and the top of the tower probably late 13th century, and possibly contemporary with the building of the nave and chancel. The lower part of the tower is so restored that I found it hard to tell how old it was. I went back inside. 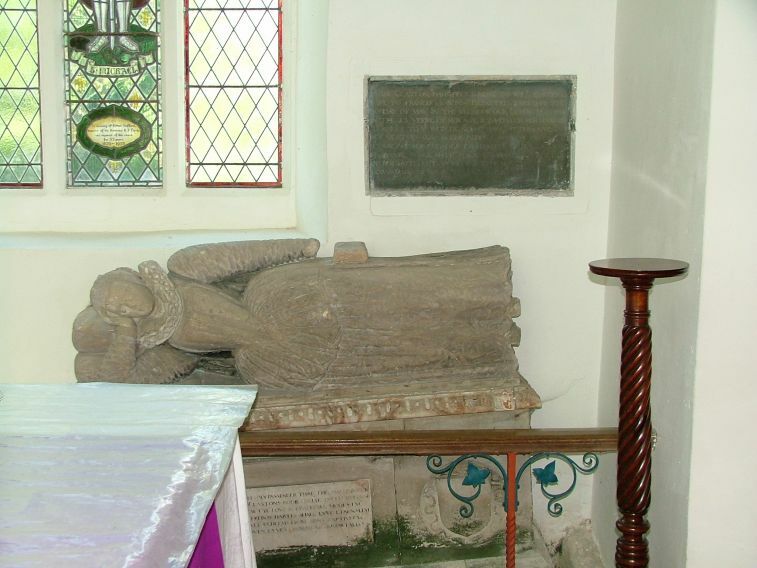 St George has three interesting memorials, all of them a bit battered. Recining at a precarious angle on the north side of the sanctuary is Rose Claxton, in late 16th century dress. Rose Claxton's Body onelye doth intombe. In her Freinds Hartes shall Lyve Eternallye. 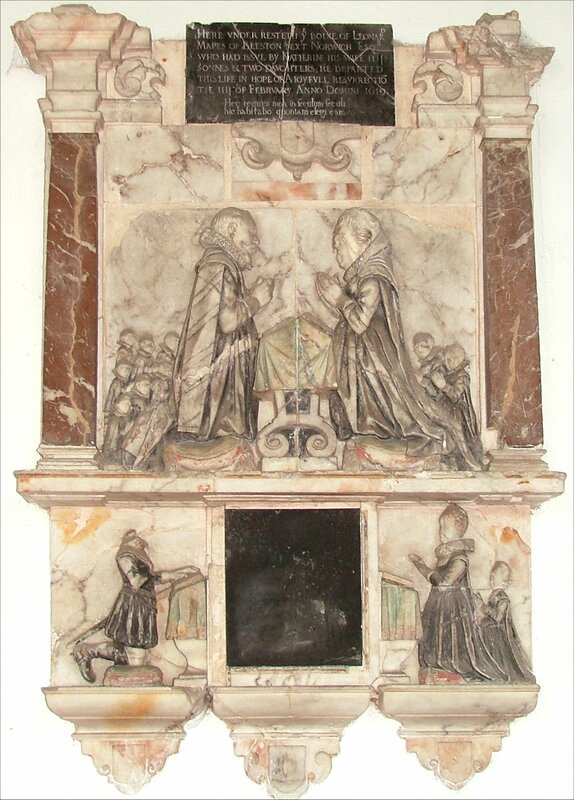 Across from her is Leonard Mapes of Beeston next Norwich with his wife and his children in alabaster, all praying together.He died in 1619, and it looks as if the top of his memorial is missing. 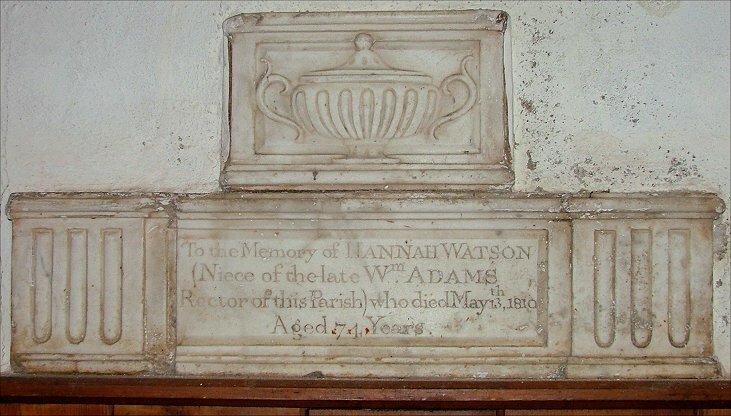 My favourite is stuck under the tower; this is a very simple memorial to Hannah Watson, who died in 1810. 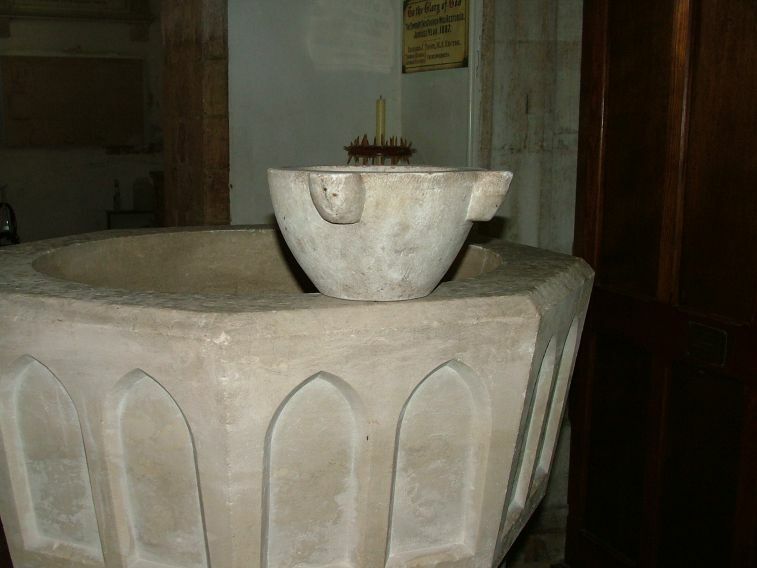 Just in front of her is the font, one of several local Purbeck marble fonts reset on a collonade. 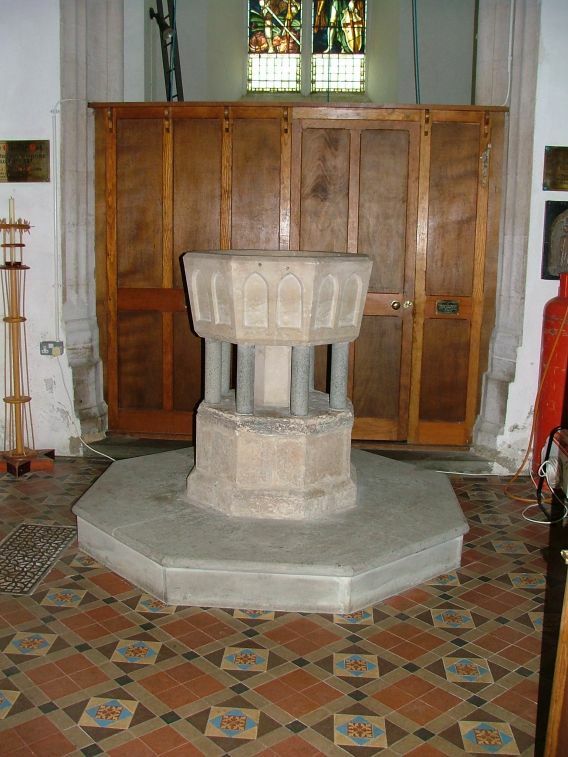 Inside it is a portable font of the sort used by energetic 19th century Rectors. And there are a couple of curiosities that are worth mentioning. 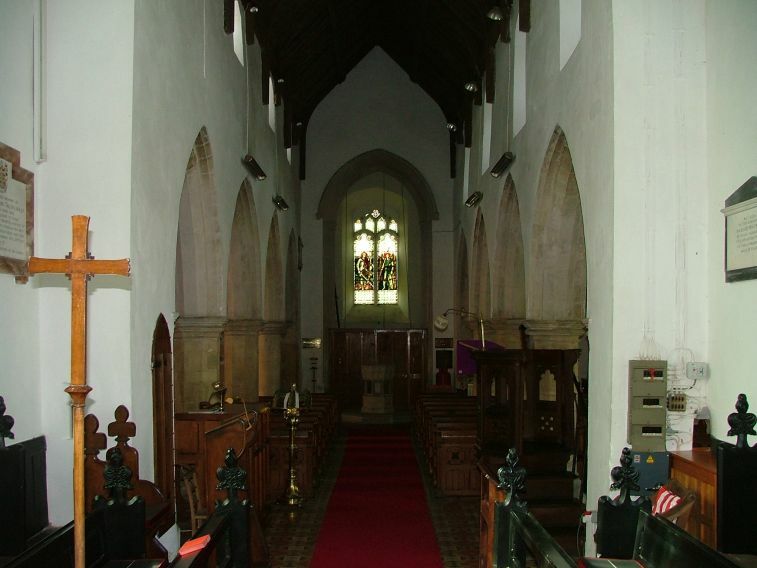 Although the nave and chancel appear broadly contemporary, the arcades do not match up with the chancel. 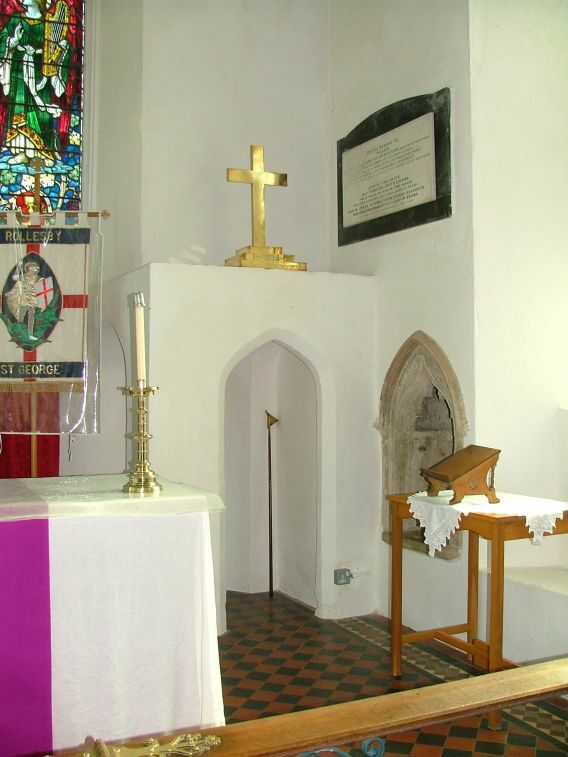 Simply, the chancel is too wide. What happened here? The obvious answer is that the arcades replaced the walls of an earlier church, and the chancel was built independently of this work. 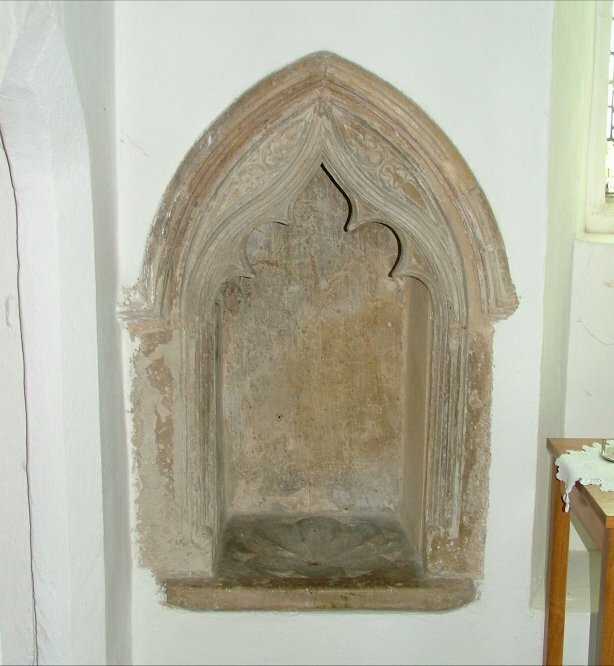 In the south-east corner of the chancel is a very curious structure, a little room built into the sanctuary. It must be a sacristy of some kind - what else could it be? But why is there nothing like it anywhere else in East Anglia?